Some members of my family have likened me to The Grinch, given my historical lack of enthusiasm for Christmas. That's why it amazes me that I am having so much fun making Christmas cards instead of viewing it as a chore. I think my heart has grown several sizes lately, all because of my rediscovered passion for cardmaking! Probably. This card was lots of fun. It wasn't difficult, but I took my time, putting it together over several days to get the layout right, since I was CAS-ing some I'd seen on the Lawn Fawn blog. The hardest part was embossing in white on black paper without getting white crumbs all over the black! 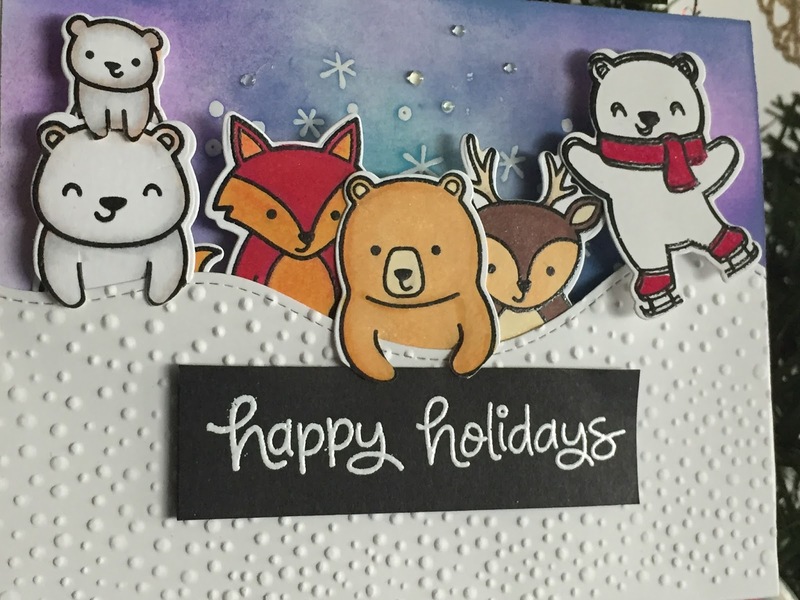 I used an embossing folder for the snowy hill and cut the hill with Lawn Fawn's Stitched Hillside Border die. I attached the sides to the background piece, which had been embossed with the stars then colored with distress oxide inks. The little animals are from two Lawn Fawn sets, cut out with dies then attached inside the pocket with foam squares. I added a little Wink of Stella to the animals and some liquid drops to the sky.